Technician was Ryan Platt: he was most professional and most engaging. The office kept us informed and quickly obtained need parts. very easy to book an appointment. seemed like a reputable company before I booked them. I'd definitely use them again! 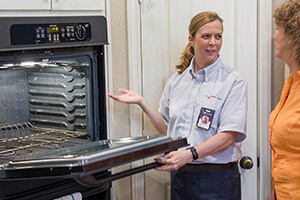 It was very easy to schedule a repair and the service person was on time and very courteous. The Professionalism that your tech had. If he didn't know something about a certain piece of equipment he would check his resources.